Rather than describe hearing loss as a percentage of loss, audiologists quantify hearing by degree, as the amount of hearing loss can vary at the different frequencies. These degrees range from normal, mild, moderate, moderately-severe, severe, or profound. These descriptors allow the audiologist to paint a clear picture of your hearing capabilities in both ears; it is nearly impossible to determine “how much” you can hear in a world of varying environments and communication partners, which is why percentages are inaccurate descriptors of hearing. A person's hearing ability is determined by a hearing test that includes listening to tones and repeating words or sentences. Dr. Chad and Dr. Pastore will plot your responses to the softest tones you can hear on a graph that is arranged by volume (decibels) and or pitch, or frequency (Hertz). Normal hearing in adults is 25 dB or better across all the frequencies important to hearing speech. Hearing impairment is considered to be 26 dB and poorer, and falls into four categories: conductive, sensorineural, mixed and neural hearing loss. Conductive hearing loss is diagnosed when sound has difficulty reaching the inner ear, or cochlea, at full volume. These problems can include, but are not limited to, malformations of the outer ear or ear canal excessive ear wax in the ear canal, fluid in the middle ear space, a hole in the eardrum, complications with the small middle ear bones, or dysfunction of the Eustachian tube. The inner ear remains unaffected in this type of hearing loss. Conductive hearing loss may be temporary or permanent, depending on the cause of the hearing loss. In cases of long-standing conductive hearing loss, hearing aids or other personal assistive devices may be recommended to help sounds better reach the inner ear. In some cases, minor medical treatment can reverse conductive hearing loss, while in others, surgical treatment may be an option. Damage to the delicate nerve cells of the inner ear results in sensorineural hearing loss. It is the most common type of hearing loss in adults and is generally a permanent condition. This damage makes it difficult for sound to be transmitted clearly and loudly to the brain, which results in a hearing loss. Routine hearing tests are needed to monitor this kind of hearing loss. 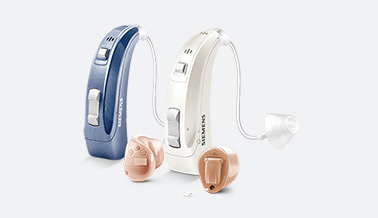 Amplification is the most common treatment, which includes hearing aids or cochlear implants in the most severe cases. When a person has both conductive and sensorineural hearing loss, it is called a mixed hearing loss. Quite literally, this hearing loss is the result of a mix of middle ear and inner ear problems. Mixed hearing loss can fluctuate depending on the cause of the conductive component. Mixed hearing loss can sometimes be treated with medical management, and hearing aids are a common treatment recommendation. Neural hearing loss is the least common type of hearing loss. It is diagnosed with when the auditory nerve is missing or dos not transmit information to the brain correctly. This form of hearing loss requires more in-depth testing for a correct diagnosis, and may include radiographic imaging. The exact location of neural hearing loss is not always evident with current test measures; therefore, frequent hearing monitoring is sometimes necessary. Because of the more complex nature of neural hearing loss, amplification is not recommended in every case. For example, some individuals will hear at normal intensity levels, although they continue to have difficulty understanding speech. Making sounds louder with hearing aids does not improve speech understanding in these cases. Individuals with neural hearing loss often have more trouble than expected in background noise.